What is The Marine Mammal Center? What educational programs do you offer? When are they available? How much do Field Trips to the Center cost? How many students can participate in each program? How many chaperones can participate in each program? How will I know that my requested date is confirmed? Do you bring live animals to the presentations? What should I do if I have more than the maximum number of participants per program? What information should I review with my students? What information should I review with my chaperones/or bus driver? What payment types do you accept and how do I pay? I can't find my confirmation letter and invoice, how do I acquire another copy? What should I do if I need to reschedule or cancel the program? Where can I find directions to The Marine Mammal Center? When should I arrive for my scheduled programs? What should I do if we are running late for our scheduled program? Where is accessible parking? Is the Center ADA accessible? Where should I check in for my scheduled program? Where are the restrooms and the drinking fountains located at your facility? May my students visit the Gift Shop? May we stay at the Center after our scheduled programs? The Marine Mammal Center is a marine mammal rescue and rehabilitation non-profit hospital located in the Marin Headlands. Our mission is to expand knowledge about marine mammals- their health and that of their ocean environment- and to inspire their global conservation. Our core work is the rescue and rehabilitation of sick and injured marine mammals, supported by state-of-the-art animal care and research facilities, a corps of dedicated volunteers, and an engaged community. Our hospital is open to the public seven days a week from 10am - 4pm. Admission is always free. For school groups, our onsite tours are available at $185 a tour. Each tour is 45 minutes long and has a capacity of 35 participants (students and chaperones). We also have a scholarship fund available on a first come, first served basis each school year. Please email learn@tmmc.org to learn more. We request that you provide no more than five chaperones (including teachers) per group. For High School students, only one chaperone (or the Teacher) is required per group. Some Sea to School programs have additional program-specific chaperone requirements. Our education landing page, MarineMammalCenter.org/education/, will navigate you toward the appropriate options for your audience. Each program will have a button that leads to a link where you can register for programs or contact our Education Programs Assistant at 415-289-7330 or learn@tmmc.org for registration support. You should receive an invoice via e-mail once you have successfully registered. Do you bring live animals to the programs? 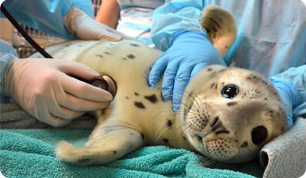 The Marine Mammal Center is a wildlife hospital; therefore we do not bring any of our patients to the programs. If you would like to view our current patients, please schedule a tour at the Center. Please contact the Education Programs Assistant immediately at (415) 289-7330 or at learn@tmmc.org to make other arrangements. The Center does not accept a pay per extra person fee, as our tours are set at a cap of participants that allows for the best experience for all. It would be in the best interest of the program participants and our educators to schedule an additional program where necessary. If you do not give notice of extra participants, our educators may choose to cancel the program on the day of, if no other arrangements can be made. Refunds are not given for program cancellations within two weeks of the scheduled program. Use quiet voices and feet when visiting the hospital. Our patients are healing and need their rest. Only walking is permitted at the Center. Please stay with your chaperone/group. Entrance to the Gift Store is by permission and accompaniment of a chaperone, a max of 5 students to a chaperone in the store at a time please. What information should I review with my chaperones/bus driver? Payment is due one month prior to the date of your program. If payment is not received by one month before your program, or you have not called to make special arrangements, your program may be cancelled. If you are unable to make this one month payment deadline, please contact the Education Programs Assistant at (415) 289-7330 or email learn@tmmc.org to make special arrangements. The Marine Mammal Center accepts the following forms of payment: cash, checks (made out and mailed to The Marine Mammal Center), and all major credit cards. Credit card payments can be made over the phone with the Education Programs Assistant or online upon initial registration. Please contact our Education Programs Assistant at (415) 289-7330 or learn@tmmc.org and include the date of the program and the best email address. A copy of your confirmation letter and invoice will be resent. Please contact the Education Programs Assistant immediately at (415) 289-7330 or learn@tmmc.org to make arrangements. Note: the months of March - June are our busiest visitation time by school groups, if you have a reservation in one of those months it may not be possible to reschedule your program until after school is out for the summer. We prefer to reschedule programs before canceling them. Please review our refund policy below for more information. Refunds or rescheduling are only accommodated on a case-by-case basis. If you feel that a refund or date transfer is justified, please email learn@tmmc.org to request an application so that our staff may consider your request based on circumstances and availability. If extreme weather or related road closures prevent you from reaching our site we will do our best to reschedule your program/tour date. If there is no mutually agreeable date and time, you will be given a refund. Where can I find directions to the Center? When should I arrive for my programs? Please plan to arrive for your programs 15 minutes before your scheduled start time, especially if you plan to visit the restroom or have a light snack before your program. Program times cannot be rearranged due to other program reservations. If you arrive more than 20 minutes late for your scheduled programs, our Educators have the right to cancel your programs on the day of. Note: Refunds are not given for program cancellations within 2 weeks of the scheduled program date. What should I do if we are running late for our programs? Please contact the Education Programs Assistant immediately at (415) 289-7330 or learn@tmmc.org. Depending on the schedule for the day, we may be able to accommodate a later start time- if we are not able to accommodate the schedule change and you are more than 20 minutes late, our Educators have the right to cancel the program entirely. Note: Refunds are not given for program cancellations within 2 weeks of the scheduled program date. Buses may park at the bottom of the hill. We prefer that passengers unload at the bottom of the hill and walk up the sidewalk to the Center. If passengers cannot walk up the hill the bus can drive up to unload passengers at the front accessible entrance. The bus must then back up part of the way down the hill before it can turn around to be parked at the bottom of the hill for the entire visit. Carpooling is encouraged for environmental reasons, and because our parking lot is not very big. Priority is given to those with ADA needs. Chaperones may park at the bottom of the hill. We prefer that passengers unload at the bottom of the hill and walk up the sidewalk to the Center. If passengers cannot walk up the hill the bus can drive up to unload passengers at the front accessible entrance. Carpooling is encouraged for environmental reasons, and because our parking lot is not very big. Priority is given to those with ADA needs. Placard parking spaces are available directly in front of the Center at the top of the hill. Buses with passengers needing accessible parking, must drop off passengers at the level spaces at the top of the hill and return to the bottom of the hill to park for the duration of the program. The entire facility is ADA accessible; there is an elevator in the courtyard for accessible viewing of our patient pens. When I arrive, where should I check in for my programs? Please keep your students on the front patio (or walk them to the restrooms), and send one delegate from your group to check in at the Information Desk in our entryway. Our Docent at the Information Desk will contact your Educator, who will meet you out front on the patio shortly. Where are the restrooms and drinking fountains located at your facility? When you arrive to the front patio, make an immediate left then a right. Follow the hallway about 20 feet and both the restrooms and the drinking fountains will be located on your left. Where may we eat lunch? There are four outside picnic tables available on a first come first served basis at our Center. For groups larger than 30 people, we encourage you to enjoy your lunch at Rodeo Beach- just a short five-minute drive from the Center, due to limited picnicking space onsite. Snacks and cold drinks are the only food available for purchase in our Gift Shop. There are no restaurants in the Marin Headlands – you must drive to Sausalito for the nearest ones. Yes, students are welcome in the store. We do ask that there is one chaperone for five students while in the gift shop at a time as there is only one register available for check out. If you are interested in scheduling additional time at the Center after the program, please make this arrangement prior to the day of the field trip. Reach out to our Education Programs Assistant at (415) 289-7330 or learn@tmmc.org to see our availability.